A highly confidential document by the Department for the Supervision for Non-Bank Financial Institutions of the Central Bank has been leaked, with the report highlighting serious concerns against the manner in which the controversial Perpetual Treasuries Limited (PTL) had conducted itself, while also benefiting vastly in terms of borrowing billions of rupees under extremely low interest rates during the tenure of Arjuna Mahendran as the Central Bank Governor. The 25 page report in the possession of Colombo Telegraph is addressed to the Monetary Board based on the findings of the on-site examination of PTL which was conducted by the Public Debt Department. The onsite investigation conducted during the periods of 24th to 26th November 2015, 26th to 28th July 2016 and 4th to 8th August 2016 has highlighted several concerns with regard to the company, which initially had direct links to Arjun Aloysius, the son in law of Mahendran. In the findings submitted to the Monetary Board, the department raised several concerns including the company’s failure to record the customer information in the Lanka Secure System promptly and accurately; Failure to enter into Master Repurchase/Reverse Repurchase Agreements with customers, although by May 2016 PTL had already signed 172 MRAs and 132 customer agreements. Another crucial concern highlighted in the document following the on-site inquiry was that PTL’s excessive bidding at auctions without adequate funding lines. 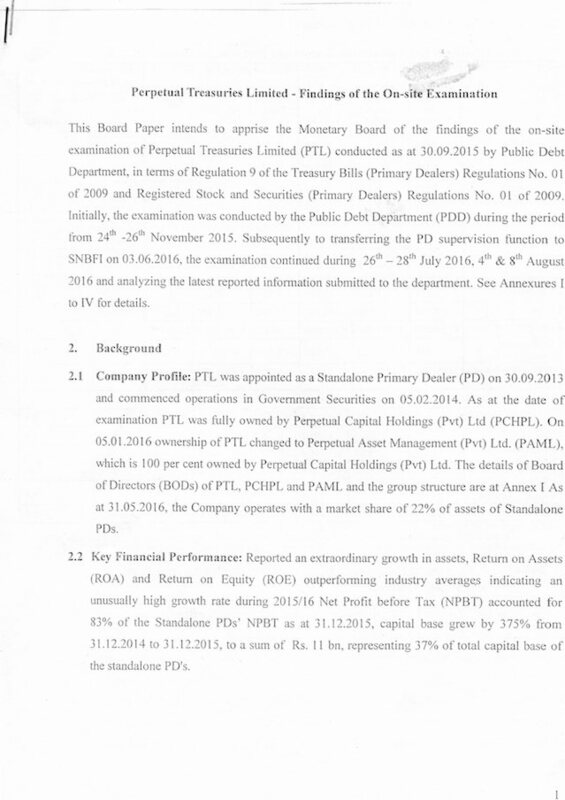 According to the document, PTL bid a total of Rs. 49.4 billon for T-bond auctions held on March 29, 2016 and March 31, 2016. On April 1, 2016, PTL had to settle Rs. 42 billion to secure the T-bonds accepted at the auctions. However, PTL did not have sufficient funds amounting to Rs. 36 billion by the settlement date and it had to resort to borrowing a significant portion of it from the Reverse Repo Auction, Intra Day Liquidity Facility and Money Market. “However, as PTL was short of acceptable securities to provide to the Central Bank, it was unable to secure adequate settlement funds. As a result, PTL was subject to a penalty of Rs. 21.3 million,” the document said. 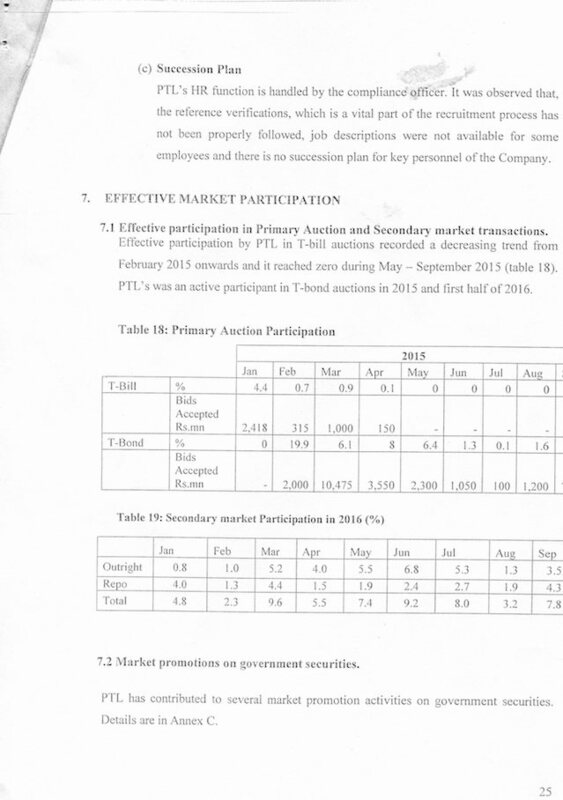 The document also said that PTL had a practice of bidding off-market rates. The document noted that bidding at off market rates in other jurisdictions is not allowed and is also a severely punishable offence. Despite initially not having the necessary funding, PTL is reported to have made extraordinary capital gains of Rs. 4,652.7 million in April and May 2016 from trading T-bonds purchased from Primary Auctions, the document said. “These securities were purchased mainly using Central Bank’s liquidity assistance available to market participates (borrowing from Reverse Repo and using ILF. By the memo dates 08.04.2016, Domestic Operations Department has highlighted their observation on the excessive use of re-repo facility by Primary Dealers. As informed by the Domestic Operations Department, from 1st to 8th April from the total borrowed amount of Rs. 89 billion by all PDs, out of which PTL had borrowed Rs. 66 billion (75%),” the document said. Meanwhile, a highly placed official attached to the Ministry of Finance said that this report that had been leaked appeared to be authentic. “I am familiar with the style of reports being prepared in Central Bank and from that familiarity, I can vouch that it is an authentic report. The report highlights arbitraging where Arjuna Mahendran deliberately kept the interest rates low and allowed PTL to borrow from Central Bank at low rates and invest in government bonds at high rates. Hence, PTL did business out of Central Bank money,” he told Colombo Telegraph. “Insiders at Central Bank told me that the officer who had prepared that report, a Deputy Director Ms. Enoka Mohotty, had been transferred out of the department a month ago; the views of the staff at Central Bank is that Perpetual Treasuries having known that the report is damaging to them had colluded with a Deputy Governor who is still working for them to get her transferred out to kill the report. So far the report has not been submitted to Monetary Board and the author is out of the department; but a whistleblower has leaked it to the press,” the official said. However, another official attached to the Central Bank said that he was not aware if it was a leaked document, but the document appears to be an Internal report following an Onsite Oversight Review. “But, I cannot vouch for the authenticity of this purported report – but the facts in it appear to be what we have believed had happened from earlier,” the official said. Perpetual Treasuries Limited, recorded a profit of Rs. 5.1 billion for the year ending March 2016. The firm has seen a staggering increase in its profits of up to 430 percent in comparison to the previous year. Since the bond scandal, Aloysius is reported to have resigned and no longer plays an active role in the company. Earlier, he headed Perpetual Treasuries as its CEO. What were the practices followed by CB in this type trading deals before 5 th Jan 2015 ? Why this type of leaks did not happen before 5th Jan 2015.? Who set this kind of trends or practices before and after 5th Jan 2015 ? Has there been any system overhaul taking place ? Why the integrity and confidentiality of the high ranking officers within the system is so bad ? Is this issue is a concern soley in the interest of the country or is concern to bring back the government of the earlier regime ? It looks like the leaks both authentic and non authentic will keep on popping up to distrupt the system. The men loyal to the old regime are every where and for them country’s future is not important. This has been SL situation for many decades now. Upside Down Economics is what there is in Sri Lanka! What kind of economic advisors has Ranil with this corrupt clown?! This is Ranil’s hand picked economic advisor! Mahendrans’s and Aloysius’ off shore bank accounts in Singapore must be seized to pay off some of the national debt of Sri Lanka. Sri Lanka is in a DEBT trap – with the Chinese on one side and IMF on the other, with the rupee crashing and Ranil going around even to New Zealand with a begging bowls, rather than stopping the massive LEAKAGE of funds due to CORRUPTION from Sri Lanka. People of Sri Lanka have been made beggars by their corrupt leaders and politicians of the 2 main parties – UNP and SLFP. The Mahinda Jarapassa family took corruption and looting and stealing from the poor people of Sri Lanka to unprecedented heights, and a living with impunity under the protection of Ranil-Sira Jarapalanaya govt. Basil Jarapasa stole from the poverty reduction fund – Divi Neguma and should have double Jailtime! JVP must educate SInhala moda masses about their corrupt leaders and the real reasons for Sri lanka’s Debt trap, crashing rupee and rising VAT taxes. People should stop paying taxes. Reduce the number of Cabinet members and politicians perks and duty free car allowances must be the first priority – to reduce national debt. You are right SM. The corrupt politicians of the UNP and SLFP and their families and cronies are a CASTE OF PARASITES, who have destroyed the country and made Sri Lankans beggars. The politicians and the giant cabinet of corrupt clowns are robbing the people of Sri Lanka, while playing SInhala Buddhist nationalism, racism and Hate speech to Distract, divide and rule the masses. Meanwhile, IMF/US and China have got Lanka in a debt trap, so that Ranil-Sira-Jarapassa now dance to their tunes, rather than look after interests of people of Sri Lanka and be ACCOUNTABLE to people of Lanka and developing the country in a socially and environmentally sustainable manner. When the time comes, Ranil will say “I don’t know who this Arjunmahendran is”??.. wait and see. ..
“Honest”, “Smart” Ranil looking more and more like a dishonest with less than stellar intelligence ! Fellow citizens, countrymen, where’s your gratitude? This is what Ranil promised; to make SL the financial hub of Asia. He promised a million good-paying jobs. This is how it’s done; 5 bil for just facilitating a bond-sale. No real work; no physical labour, no one has to break a sweat. Imagine a million people financial-hubbing. I always said that only Ranil has the ability/talent to drag us into the modern world. Here’s the proof! Here’s the talent! Did he waste any time? Started from day one; such dedication. All what happened was 5 bil ended up in PT account. Nothing illegal, no one is in jail. People still can’t even figure-out what the hell went on. That’s Ranil’s brilliance! The only SL man with the intelligence to study Sandy Burger, Tim Geithner, Hank Paulson……. and learn how it’s done. Modern world, here we come. You know I am not fluent in finance or in financial matters. ROA, ROE, Stand alone primary dealer, Appointed on 30/09/13, Commenced operation in Government Securities on 5/02/2014, capital base, compliance officer, primary auction, secondary auction, ….. When I checked the word roe (ROE)on google I found that Roe means fish egg or clever pimp. On the other hand ROA is the acronym for Racehorse Owners Association. Were you Mr Pira’s advisor on Mahavamsa History and Bastardization of Buddhism?. Don’t tell me you put your hard earned money with William Hill to know about ROA? Or is it Ladbrooks in London?.. Either of them wouldn’t give you anything more than 100 to 1 max, even if you happened a pick one. And that is ROI with a G in front. who will not succumb to cheating foxes? This is the bane of our country.Until and unless we address this malady before we talk of good governance we will see the entire fabric of society will inevitably crumble. Our prime Minister will say that people don’t know the difference between Soverign Bonds and James Bond ! Only Arjun Mahendran , Aloysius and Ranil Wickramasinghe knows about these things ! What a clever dude this Mahendran is. Pity he went into pre mature retirement which is a great loss to our mother nation. Mahendran lent Billions of Yahapalana Rupees to Aloysious’s company at low rates and borrowed it back for Yahapalanaya at higher rates. One has a to be a genius to do this sort of Financial Engineering. 5 Billion even in Yahapalana Ruppeses in just 12 months is awesome. Wonder whether we can invest a few bob in Perpetual Trustees?.Because even fixed interest I get now is only 2 percent. Was it a case of crooks hiring crooks? Your mate Mahendran’s Family Company was struggling to make LKR 70 Million profit in 2014 / 2015 financial Year on just under LKR 800 Mil turnover.. In 2015./ 2016 Aloysious banked 5000 Million in cool cash.all in Yahapalana LKR. Convereted of course to S$ and USD.. Please check whether your dates tally with this financial performance ..
It’s a bit too late to invest in PT now as both Arjun and his SiL Aloysius have left their ‘ no-conflict-in-interest’ jobs; these two must be enjoying a drink on a yacht anchored near a Caribbean island and laughing their guts out.The only one missing in this company to raise a toast is Ra Anil. True or not, that is the question? Sri Lanka today is caught between the IMF and Chinese loans induced DEBT TRAP. This situation has has been caused by the bi-partisanm SLFP-UNP CORRUPTION, politicians and their corrupt Central Bank appointees, and stupid Finance Ministers and advisors! Mahendran and Nivard Cabraal must be jailed and their assets ceased to pay off some of the National Debt. Ravi K. is a brainless crook and Basil Jarapassa the former so called Minister of Economic Development a high school drop out! How can these corrupt clowns run the national economy? JVP and Anura Kumara must launch a protest about impunity for financial crimes under Rani-Sir Jara-palanaya, and people should refuse to pay VAT and income tax. Taxing the poor while the corrupt politicians who have fattened themselves on the National Debt are scot free, diving in SUper luxury SUVs and wining and dining in the Parliament of clowns must stop. This is a joke! Those who are responsible for the Mahinda Jarapassa Vanity project called Mihin Air and its massive DEBT that is being loaded onto the people of Lanka must also be held ACCOUNTABLE for their FINANCIAL CRIMES. What are Jarapalaya Ranil and Sira upto – piling VAT taxes onto poor people to pay off the debts of CORRUPT POLITICIANS of the SLFP and keep the corrupt Mahinda Jarapassa family , brothers sons and crooks in luxury villas and SUVs and overseas juants?! In Sri lanka chosen LEaders are dumb and brain dead. Their only escape is hiding it from people. They all ruin the country. What does your Galkatas Man ( Anura) know about Economics Development in the Country??? He thought Southern Highway open for bringing ‘Maalu Ebul Thiyal’from Matara to Colombo. That bugger should hung on his balls (I don’t know bugger has). Ah! this is what PM Honest RW meant when he said Sri Lanka is making progress to John Key in New Zealand.I wonder he offered his close mate Arajuna Mahendran and his son in law Aloysius’s service’s to New Zealand to improve the economy.Surely he would have recommended Perpetual Trust as the best around cant argue with 438% increase this make Bernie Meadows second rate crook. Now everyone knows what a rogue Ranil is . UNP has stopped whitewashing this rogue. now than during the era of Mahinda Rajapaksa. Mr Clean and his people. above the law.Similar Court ruling has been delivered. they will not be like most of our judges. What a waste of valuable journalistic space in publishing this report. Hon Handunetti, COPE Chairman is publishing his report, shortly. Some interested parties leaked this report to make sure Handunetti has written the same thing. I read a great article in Colombo Telegraph a couple of months ago written by an intelligent investigative journalist. The simple answer is to request Commissioner of Elections(under the spanking new RTI laws) to publish political contributions by Mr Aloysius to the UNP and the SLFP in the past 6 years. Well, Arjun Aloysius and Arjun Mahendran live in the same house. They probably share a bed too. However, next morning they come to work and pretend not to know each other when dealing with large amounts of public money. The ecomony that used to grow at 8% have come crashing down to 3% – all under the economny managed by Tamils. This Tamil is corrupt. The one in the north is incompetent. The opposition leader is useless. I don’t know, I think Tamils should not be appointed to positions of responsibilities. The mega projects of the previous govt were over priced ten times and if you adjust for that the 3% growth is double the growth you had. Take a breather, look around and ask your self how these politicians and the scavengers that walk behind them got so rich in this short a time. Common sense does not seem to be that common in Sri Lanka. You look at how PERPETUAL TREASURIES got very high and unimaginable profit margin just over a year. It will be a sure hit like Mahavamsa FM’s nemesis, General Kamal’s Ranaviru March to Nanthikadal. Field Marshal’s own book plan got dissed by a MP from his own turf. She is harsh isn’t she unlike me. But I am more generous .. He should name it Kalavedda’s Guide to Nanthikadal. as the locals in his home town now affectionately call him. mahendran seems very worried.he is thinking how come his grand plans of transforming srilanka into a singapore lies shattered to smithereens.Doesn’t this qualified fool understand that to make srilanka into singapore you have to vacate the srilankans in boats carrying seven hundred each and then bring the singaporeans little by little into srilanka like kallathonis and coolies did here before they got corrupted by the vijayans and lost their work ethics. or on second thoughts iam thinking whether he is thinking how to get hold of that 5 billion in perpetual accounts.he seems to be worried that aloysius might play him out.Can’t trust son inlaws or mother in laws al all. It is very ifficult to know what is going on in someone else’s head except to make some good guesses.from the ayes and nos i will know which one is right. insider trading, fil & sil fine 3times and jail 30years. Mr De Silva’s comments are valuable. The Tamils are no good at managing economic affairs. In the North, the law is known as Thesa Valamai. Vigneswaran and Sumanthiram and Sampanthan are all driven by Thesa Valami and not by the constitution of Sri Lanka. It is a pity they have been given the Leadership of the opposition. If not for Mahinda Rajapaksa’s JO, are parliament would have become an instrument of dictatorial oppression. yes.profits is not cash flow.now must see where the cash has gone,into whose bank accounts.CID should be called in to detect the cash trail.These guys are not fools.they would have covered it well through HK etc. Who is the master thief of the bond scandal? Yes my gut feeling says he is RW. AM and AA are the other main partners in crime. They benefited immensely from the public money, that is our tax money. If your referring to the Greek Bonds then it is your King and Cabral. Here there is no case or scandal so now they are trying to persecute him through the media. That’s all. There is no case for you. But certainly there is a case for all the citizenry of the country because the losses due to the bond scam as it is confirmed again by the Auditor General will be affected to the general public of the country. All the governments to be elected over the next 30 years had to bear the brunt of this mega scale corruption by clean suit RW and AM. If Cabral et al had done anything wrong, I am not worried about prosecuting them within legal means. On the other hand, the case of the Greek bond was heard in the SC. For instance, you are going to buy a basket of eggs. It is unavoidable that you will find at least one or two bad eggs. Similarly, you will do investments in several companies but all may not give profits for you due to unforeseen conditions. But if you can earn a net profit by considering all your investments as one basket of investment, then you can satisfy. This was the decision of the SC in simple terms in the above case. However, it is the duty of the Central Bank to maximise the profit by investing prudently. On the other hand, investment is all ways with a certain degree of risk. If you do not like to take risk, then it is better to keep money deposited in a bank or at home. Still I doubt about the risk because thieves can steal your money or your bank may bankrupt. My understanding is that then government did a “Sakvithi” type investment in Greek bonds because the interest rate was high due to the volatility. However, the Greek bonds did not bear fruits as Greek went bankrupt by defaulting. It is better to investigate it to understand any professional negligence. But the case in Bond Scam by Arjun and Ranil is so intentional and there were a lot of mechanisation to get that undue and exorbitant profit. Thus, your arguments are absurd because there are so many hard evidences and facts against both RW and AM and you do not give any reason to justify your argument. Are we all holding on to the wrong end of the tail? The most important question all of us have to ask is “what is the illegal activity that took place”? Just because some one in the Joint Opposition who does not have any or not that many voters supporting him complain it does not become an illegal activity. It only shows how bankrupt these complainers are. If the practice and the law allowed them to bid without having sufficient money, then there is nothing wrong. If they were allowed to borrow money to meet their obligations without violating any laws, then there is nothing wrong. We cannot super impose the practices and laws of other countries. We are a young growing economy and our laws have to be polished, no doubt about it, but cannot be applied without those laws being in the books of Sri Lanka. A private company making large profits is not a violation of he law. If any specific laws is violated, at the time of our MP Mahinda Rajapakse who was a President, or prior to him or after him, then we can find fault for what happened. Let us all catch the right end of the tail.